On Wednesday Surrey Connects held an annual conference with three outstanding speakers, and it was inspirational to hear them. Mathew Taylor is CEO of the Royal Society of Arts and he gave a discourse in political philosophy the like of which I have not heard since my days at the LSE. His theme was about how we can all be empowered to be creative because the technology of the internet and digital/information economy enables this. He cited the way in which young people are embracing becoming entrepreneurs/sole traders; how folk could reach out to global markets and so on. The barriers to this world are own culture (what Erich Fromm called “The Fear of Freedom”), traditional institutions holding on to power, and related to this a lack of fairness and creativity especially in relation to having capital which he saw as an important enabling resource. He commended the work of Charles Leadbetter and his phrase about the (political ) future resting with “Creative communities with a cause”, and of roles in “mobilising communities to find solutions for themselves”. As someone who wrote an MPhil research degree (1996-2000) about organisations as networks, not hierarchies, this was music to my ears. Neil McInroy is CEO of the Centre for Local Economic Strategies. He spoke of the inter-dependence between the social (charity)economy – public economy - private economy, and the need for people in business to see themselves in a wider(community ) context – what he called “business citizens”. In short these two speakers put forward a superb rationale for our CommUniLAB project, which enables these linkages and networks to be made in relation to community causes. The third speaker was Sue Riddlestone, CEO of Bioregional talking in practical terms about “One planet earth” – we consume three times what planet earth can sustain. On Tuesday, I gave a talk at a breakfast meeting at Foxhills about “Managing across the digital generations”, making the point that I have also stated in “Young Surrey : Strategic Review” that as people work longer, so larger organisations will have employees from across 4 generations - Baby boomers like me, then Generations X, Y and Z- the latter being today’s teenagers of current university students. They all have different values, life experiences, skills and expectations, so how do you manage across the generations? Secondly how can Generation Z also called the citizen Generation be enabled to enter the world of working? One of my concerns is that if today’s young people don’t vote at the forthcoming elections they will continue to be disempowered; this speaks to Mathew Taylor’s point. Consider for example the Arab Spring – enabled by Twitter, Blackberry etc as a community movement, but now traditional forces/institutions have re- asserted power. We are making progress on organising a conference in November, probably at Royal Holloway College on what the Government calls Youth Social Action, and this will include inputs on what citizenship means. On Wednesday, I had lunch with my fellow directors of Surrey Youth Enterprise, and with one of our Trustees about the future of the enterprise which was very encouraging. For the rest I have been working on preparing our papers for Pqasso external assessment, and am grateful to colleagues from Allianz (walking the walk as business citizens already) for their help in this. We are delighted to have launched our CommUniLAB website which can be found at: www.communilab.org CommuniLAB is a virtual network that enables people in communities, universities and colleges, the public sector and business to voice problems that they would like to see addressed. For once we take off our “work “ hat we discover that as parents or as partners we face similar concerns and issues. This might be about the prevalence of bullying - a matter that came up at the Child and Adolescent Mental Health (CAMHS) Strategy Board I was at yesterday - or the provision of childcare, or how to secure volunteering or work experience opportunities for one’s teenagers, or as a business how to offer such opportunities, or how to contribute to the lessening of disadvantage in a particular. 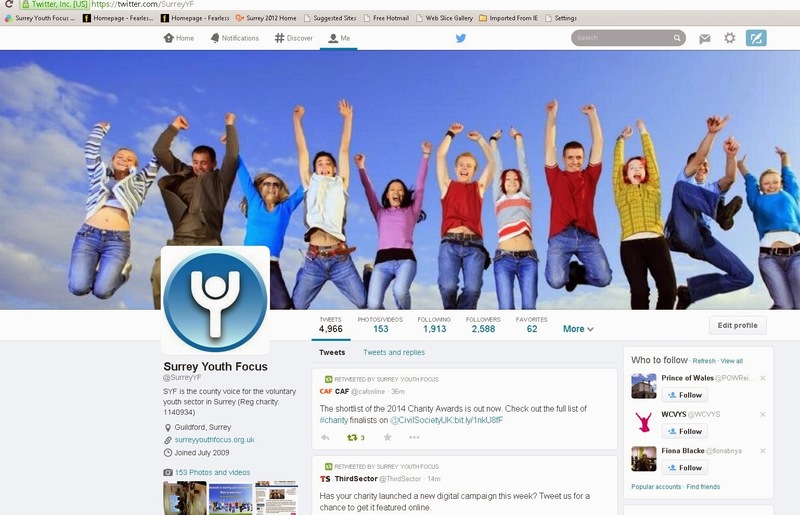 All Surrey Youth Focus are automatically members of CommUniLAB; if you are interested and want to join this exciting new network contact Linda Cairns, project manager linda.cairns@surreyyouthfocus.org.uk. Our thanks to Barclays Bank as our principal sponsors and project champions. One of the points I make in “Young Surrey : Strategic Review” is that the ever –reducing Government funding makes it imperative that the resources across the charity - local government – business sectors are pooled, or “mined”, to address shared issues. I am off this afternoon to witness a perfect example of this – Elmbridge BC/ Surrey CC/Walton Charities combining over their “Streets Apart” project. The Management and Finance sub-committee of Trustees signed off on the Annual Report and Accounts for last year which now goes on to the main Board. Also reviewed the Risk Register and approved the processes for project planning and evaluation. This includes addressing the Inputs - Outputs – Outcomes trilogy, and is necessary as part of the preparation for our Pqasso (qa) review – very grateful to Allianz (insurance ) for all their help to us. The same methodology is being applied to our Agreement with Surrey CC for our core grant. Even busier next week with two early morning talks – one of which is me talking to Surrey Chamber of Commerce about “Managing across generations” – Foxhills 7.30 am – nearly 40 people have booked in apparently! World Cup expectations met! I have booked my flight to Biarritz on 13 Sept and hence on to St Jean des Pied to start my walk on the following Monday early – as dawn rises. I have been walking part of the South Downs Way these last 4 days…56 miles of training walk with my “Spanish” rucksack ie checking on my kit and weight for my long walk in Spain later. So I was pleased to be walking in the heat with a full rucksack and have decided to jettison one bit of kit as a result. Lots of stories to tell of course, but mainly about how incredibly kind and engaging people are when out in the countryside and away from it all. I walked from Bury hill to Beachy Head/Eastbourne centre to catch a train home, and learnt a lot. The countryside was incredibly beautiful especially between Ditchling and Alfriston. I returned to work today to lots of emails and catch up..ugh…hot in office. But the sporting scene this week-end is good : Holland v Spain in the World Cup tonight, and England v. the All Blacks 2nd Test tomorrow. And we’re going to the 40th wedding anniversary celebrations of some friends on Saturday – should be an enjoyable week-end. A very important headline announcement has appeared in the charity press to the effect that Surrey CC Youth Support Service is working with the Cabinet Office to prepare for outsourcing as a mutual. This was exactly the possibility that is referred to in “Young Surrey : Strategic Review 2014-15” in which I wrote about the blending of the sectors, and referred to LB Kensington and Chelsea’s setting up of their youth service as EPIC, which is also a mutual. It is too early to say what the impact will be, but IF this happens it will be significant, and is a parallel move to Surrey CC transferring all its adult social care into a LATC (local authority trading company). I have a Surrey Charity Chief executives Group meeting this afternoon, and so we will have an interesting discussion. The bottom line is that what I call the “blended sector” is here to stay, so we might as well work on how to make it work. I have been working on our Annual Report which is now substantially completed and on very interesting work about the health needs of young people. We have been commissioned by Healthwatch (the consumer champions) to research into the experiences, issues and priorities of young people about heir health and well being. We are doing so by survey monkey and focus groups. The report is due out at the end of August. I’m on leave most of next week walking 55 miles on the South Downs Way (from Bury to Beachy Head) as a training exercise for an altogether longer walk later. I’ll report next Friday on the fauna and flora and my recommendations about pubs!